Founded in 1980, Brown Safe Manufacturing has grown into the premiere safe and vault company providing security solutions around the world. Building a 35 year reputation as the industry leader in unsurpassed quality and protection has established them as the preeminent builder of the most refined high-security safes and vaults for the most discerning of clients. 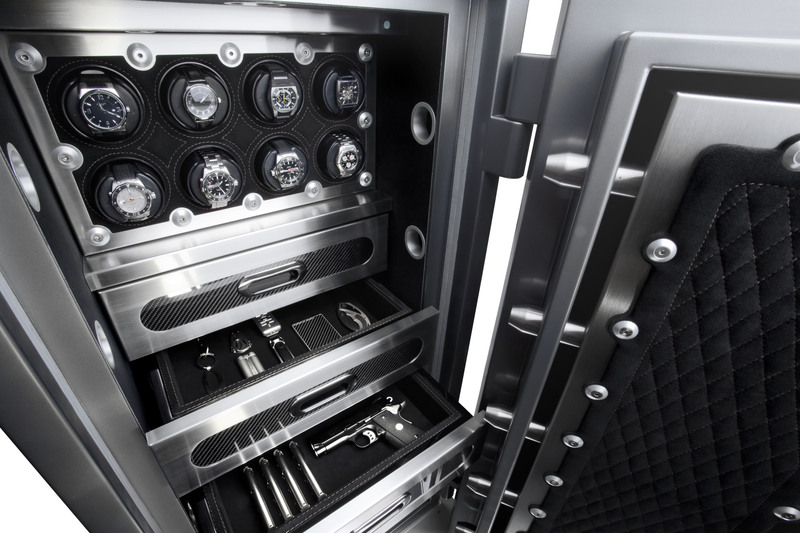 Their product lines range from robust military products built to withstand severe attack, luxury jewelry safes with exotic metal and wood interiors, and even antique collector vault doors. Jewelry safes are the most popular Brown Safe models due to their refined design, organizational benefits, and ease of use. These well-appointed safes are designed to securely store your jewelry collection without sacrificing the convenience, organization and elegance of a jewelry box. The Gem Series of luxury jewelry safes by Brown Safe are built to the same standards of superior durability and exceptional performance as their industrial products, while preserving a refined form that’s sure to please even the most discriminating of clients. 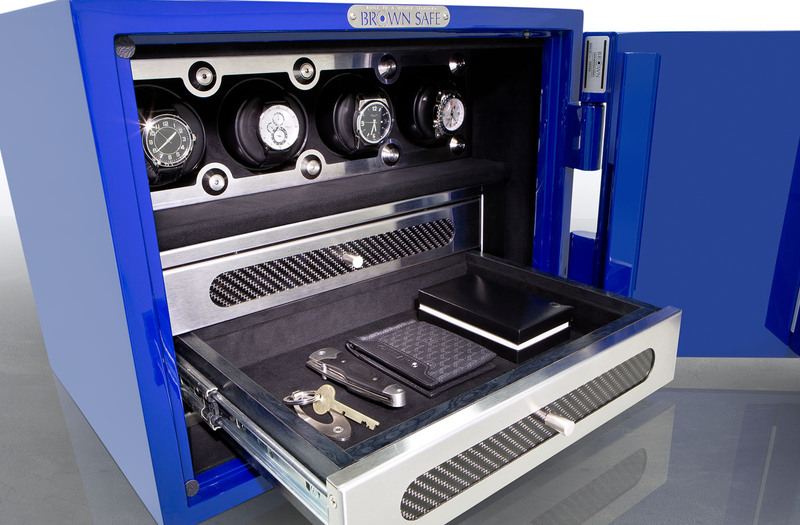 Each safe is custom built to the owner’s specifications, including color of the high-gloss paint finish, interior lining, hardwood type, and more. 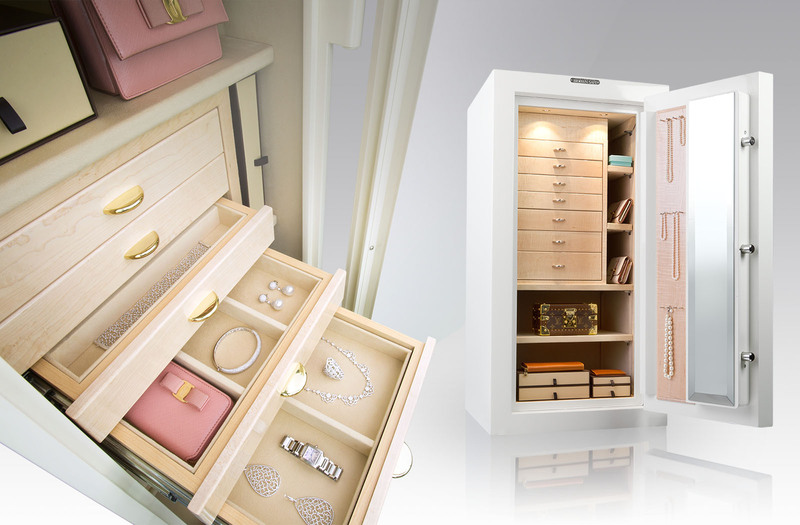 Additional features like interior lighting, door-mounted necklace racks and mirrors, and custom drawer inserts enhance the safe’s ability to help get the most out of your jewelry collection. These high-quality products specifically cater to those customers who demand the highest in quality, security, and long term reliability. In an effort to better serve those same client’s needs to house and protect a larger valuables, Brown Safe has designed the Estate Series. The Estate Series represents a heavyweight lineup of luxury safe offerings specifically designed to fit a variety of needs. These monumental luxurious security systems are available in single or double door configurations and multiple protection levels. 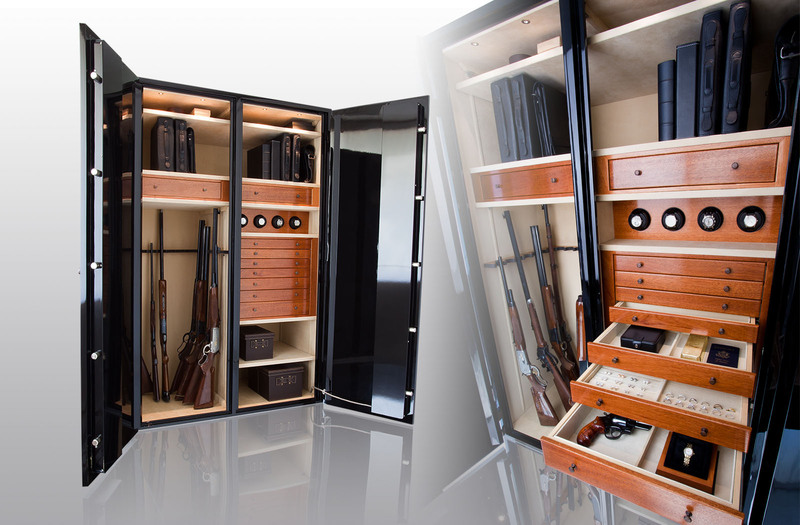 Interior configurations are varied and customizable to include specific layouts for jewelry, important documents, firearms, and practically anything else one might need to keep securely protected for generations to come. 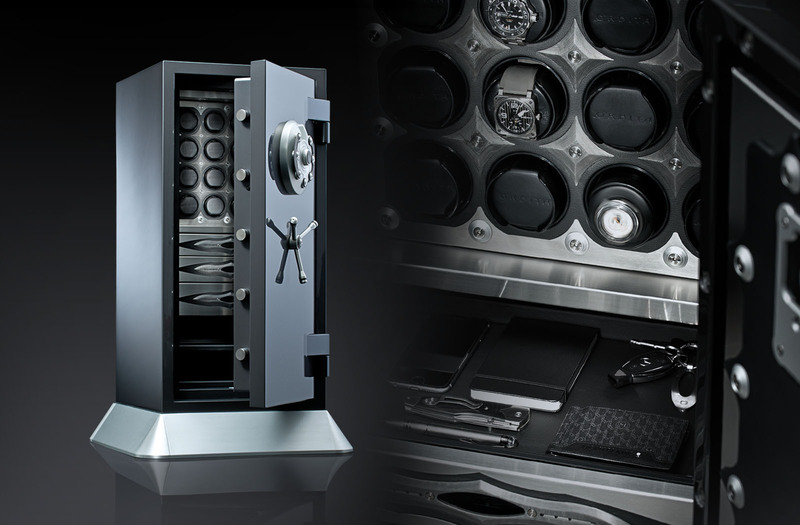 The Man Safe series of luxury burglary safes are designed and created specifically for the needs of the modern man. 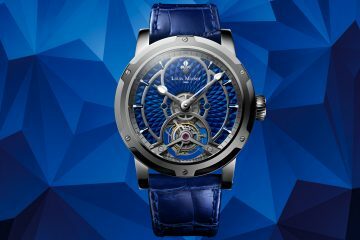 These premium safes are manufactured expressly for the watch enthusiast who demands the finest protection, organization, and convenient storage for their timepieces. Available in three standard sizes, they’ve built this safe to be all that a man needs to securely store his watches and other valuables in an easy to access high-security package. Beautifully finished watch panels housing Orbita winders keep fine timepieces organized and running perfectly, while convenient access to your secure watch collection is provided by an easy-to-use electronic keypad or biometric entry. 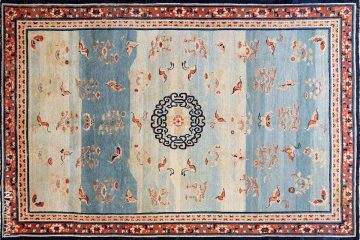 Multiple interior configurations are available to best suit the needs of collections large and small, and interior finishes of exotic hardwoods or brushed stainless allow you to tailor them to fit your individual style as well. Available in either a black metallic or pearl white gloss finish with a matching lock and handle in your choice of brushed stainless or satin black means these beauties look as good as they perform. A major difference in everything produced by Brown Safe is their steadfast commitment to quality. In an age where an increasing number of manufactures choose volume over value by moving to overseas manufacturing and inadequate materials – Brown Safe represents an American made product of the highest value. By delivering protection way beyond their competitors Brown Safe inspires a peace of mind that is priceless. An example of this commitment to progression and the desire to build the world’s finest security products can be found in Brown Safe’s most impressive safe, The Chronos. The Chronos Series by Brown Safe represents the most advanced safe ever produced. It is fully constructed of military-grade ballistic armor, steel so strong that a FBI safe cracker had to call Brown Safe for help after two full days of attempted entry. That ballistic steel core is then encased in a proprietary concrete amalgamate outer shell to provide full fire protection and an additional level of burglary resistance. The door is fortified with four-way boltwork of multiple 1 ½ thick titanium locking bolts which pass through a solid steel door carriage at two points to make a door that is incredibly resistant to leverage attacks, and a splendid design feature that reminds the owner of the safe’s imposing strength and refined design. Beyond the cutting edge materials and construction, multiple additional security counter-measures are added to the innovative design which propels the protection rating of the Chronos far beyond any existing rating level structure. Its ability to thwart illicit attempts of entry is extraordinary, but the Chronos’ features set is equally as remarkable. Originally conceived as the greatest automatic watch safe ever produced, the Chronos Series comes complete with automatic watch winder panels made specifically to protect, display, and keep the owner’s fine timepiece collection operating in top form at all times. An available GPS anti-theft system or the ability to integrate the safe with the home automation security system can alert the owner of attempted entries or removal of the safe – which at over 1,700 pounds isn’t likely. Additional security features include a panic button which sends a silent signal to authorities, glass plate re-lockers, and redundant time-locks that keep the safe inoperable for a set amount of time determined by the owner. A biometric fingerprint-reading lock housed within a custom aircraft-grade aluminum entry enclosure ensures both high-tech security and dependable opening at the swipe of the owner’s finger. As with all Brown Safe products the safe is completely customizable for the owner’s specific needs and style. Clients can select from a beautiful selection of high-end luxury auto quality finishes, custom colors, and even completely carbon fiber wrapped models. Interiors are fully lined in fine Ultrasuede or full grain leather with hand sewn accents and detailing. If you are in the market for a quality safe to protect and organize your valued treasures, you can be sure Brown Safe has the perfect product to suit your needs. For more information on immediately available safes or to design your own call (760) 233-2293 or visit www. BrownSafe.com.